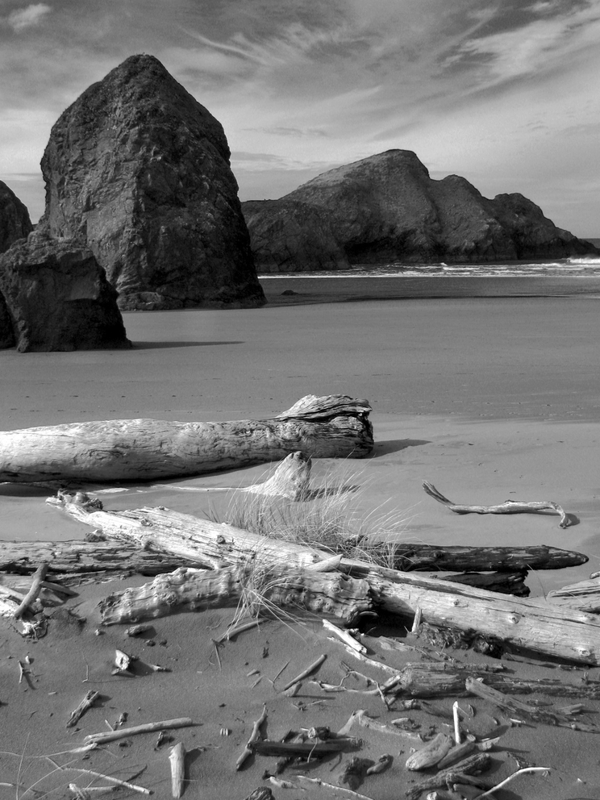 A northwest beach is a driftwood beach, and by that I don’t mean a stray twig or coconut shell washed ashore. 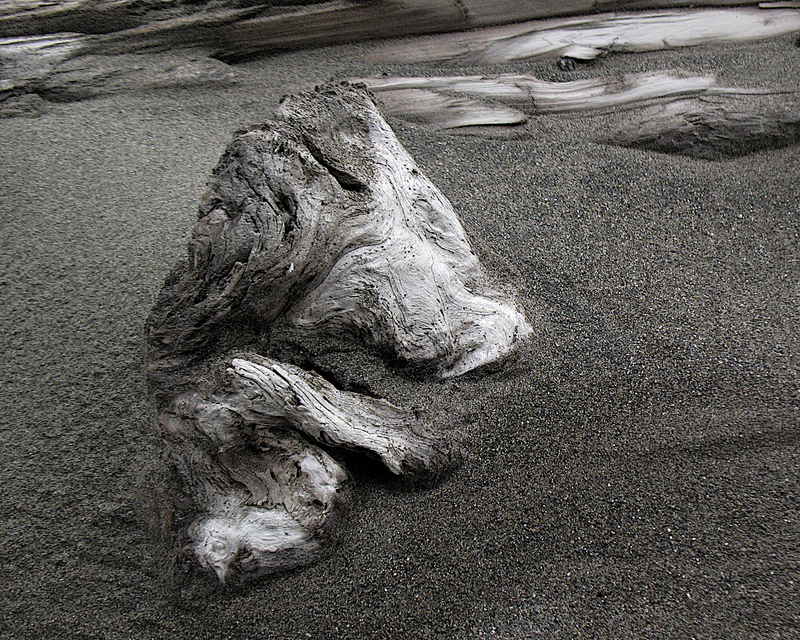 Northwest driftwood is a defining essence of the beachscape, as indigenous as the windblown capes. Driftwood here means immense weathered logs, washed up like toothpicks in Pacific storms, roots, trunks, limbs all sanded, and stripped to essentials, gleaming, buried in dark sands, giant tree trunks washed down in rainforest canyon floods, but mostly ponderous sections of cut logs, fallen from ships I suppose, or the Paul Bunyan scraps from clear cutting that have found their tragic ways to the sea. 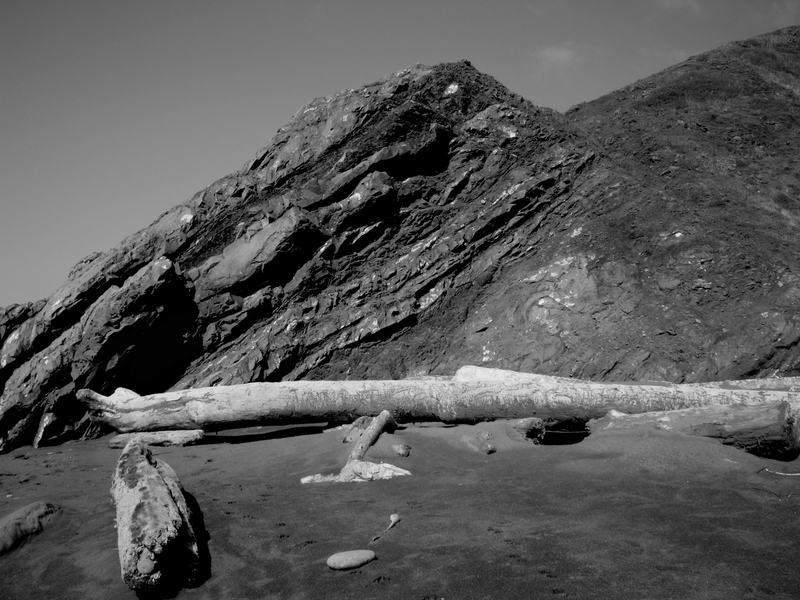 Some driftwood is historic—it appears to be part of the sand, like shells or stones, and it may be that a timber from a San Francisco bound lumber schooner is buried in the strand, providing shelter from sandy winds as you enjoy a quick lunch. 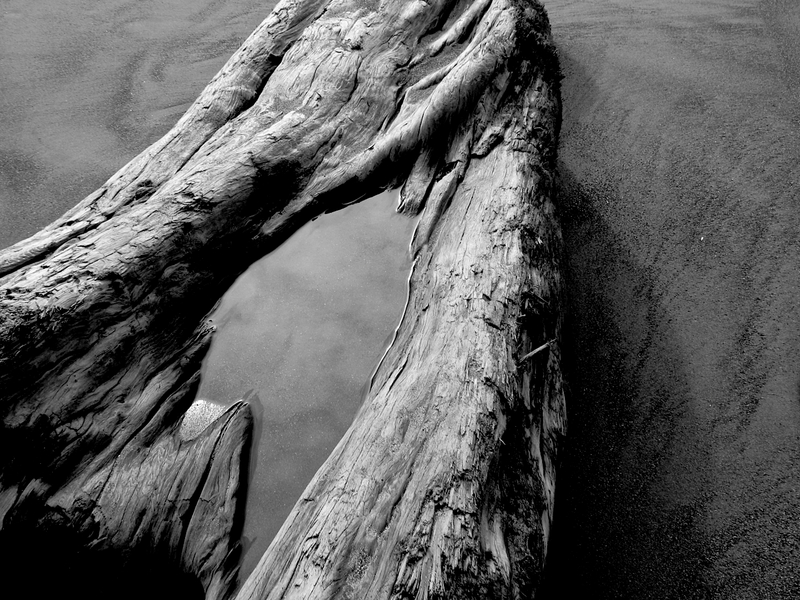 The photographic possibilities of driftwood on the wild beach are literally without end. 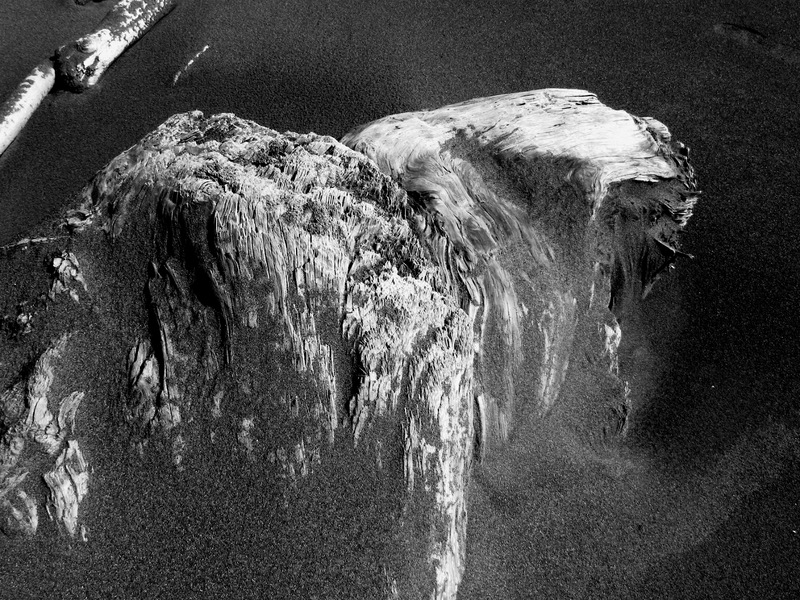 Overcast to weak sun are the favored conditions for photographic detail, revealing beautiful wavelike woodgrain, writhing forms that have Hansel and Gretel overtones, or clean contemporary monotonic minimalism. Glaring light means blowout on silver highlights on weathered wood. The dynamic range is too great. 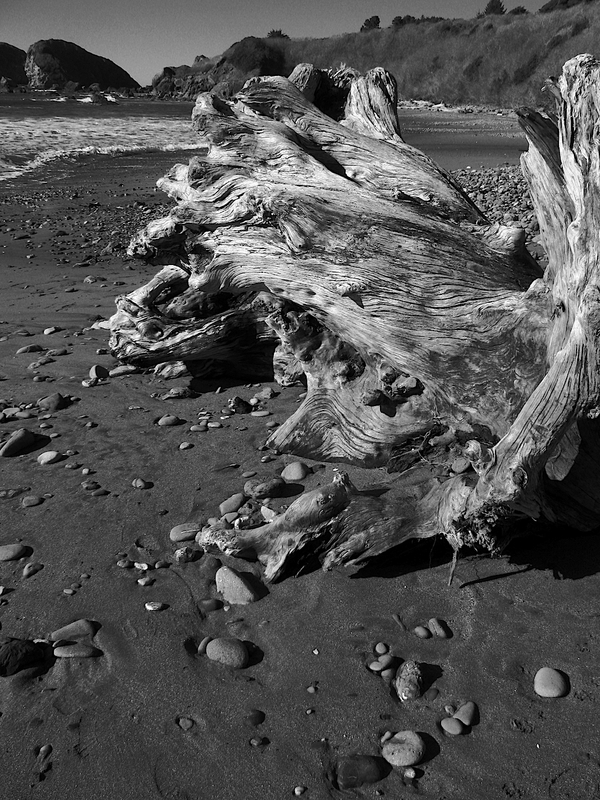 The forms are the thing, as well as wood grain detail, and of course the endless compositional challenges of driftwood scattered in sand and seaweed.